CLAIM: A coalition of environmental groups, including the Atchafalaya Basinkeeper and Sierra Club, claimed in a federal lawsuit that the developer of the Bayou Bridge Pipeline has violated the terms of a federal permit issued for the project. On Jan. 23, a coalition of environmental groups filed a petition asking a federal court to halt construction of the Bayou Bridge Pipeline in Louisiana’s Atchafalaya Basin. 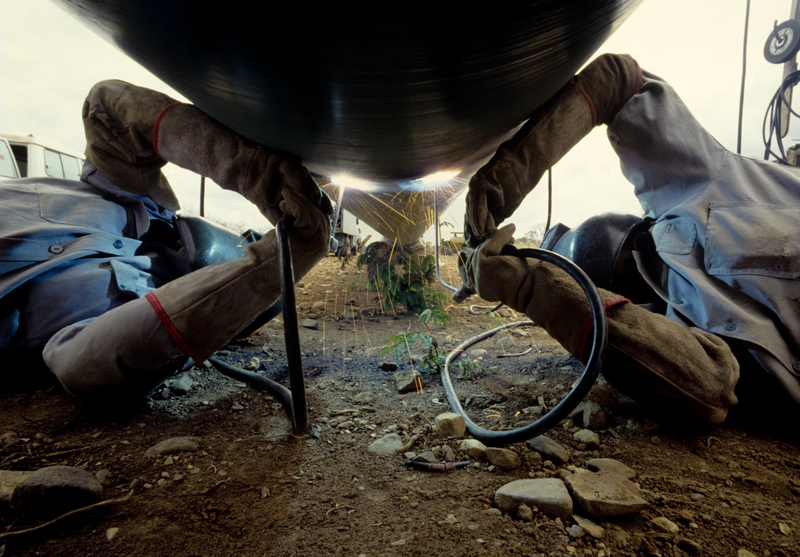 The coalition alleges that the project’s developer has continued to work on the 163-mile pipeline despite a federal permit provision barring construction activity during high-water conditions. This claim is false given the evidence provided showed the construction activity in question took place more than three and a half miles away from the nearest segment of project to which the permit applies. The permit, known as a Section 408 permission, is issued by the Army Corps of Engineers and applies any project or activity that alters a federal civil works project, such as damn or a levee. Bayou Bridge sought and received eight Section 408 authorizations, as indicated by the blue and green dots in the below map provided by the Corps. A provision in the project’s Section 408 permits, known as Condition M, restricts construction activity during “high river” events, which occur when the Carrollton Station flood gage, located in the New Orleans section of the Mississippi River, reads 11-feet or more. The gage first exceeded 11-feet three months ago and has remained consistently over that threshold since mid-December. However, no work was performed in any area that would have been a violation of the permit restriction. 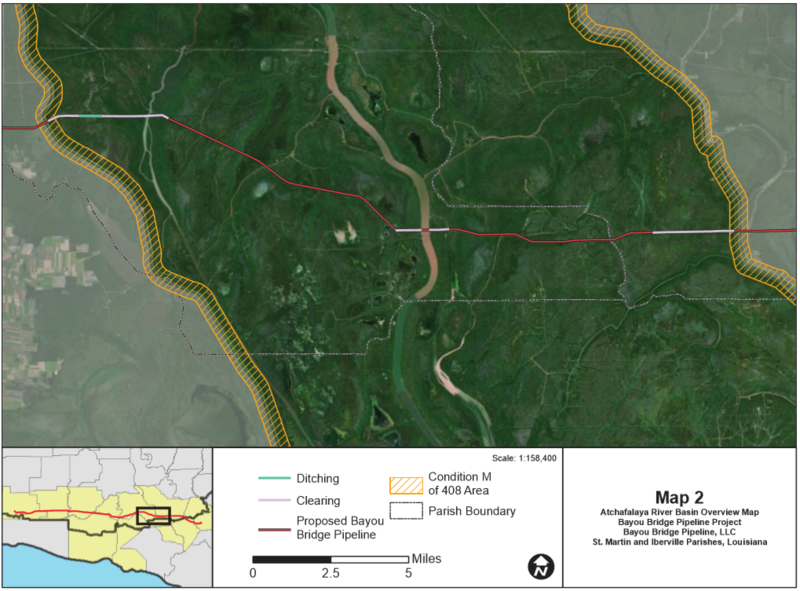 The coalition, which includes the Sierra Club and the Atchafalaya Basinkeeper, has falsely concluded that Section 408 and Condition M applies to the totality of the pipeline’s route through the Atchafalaya Basin. This is incorrect given that Section 408 jurisdiction is limited to the locations in which the pipeline crosses a federal project. 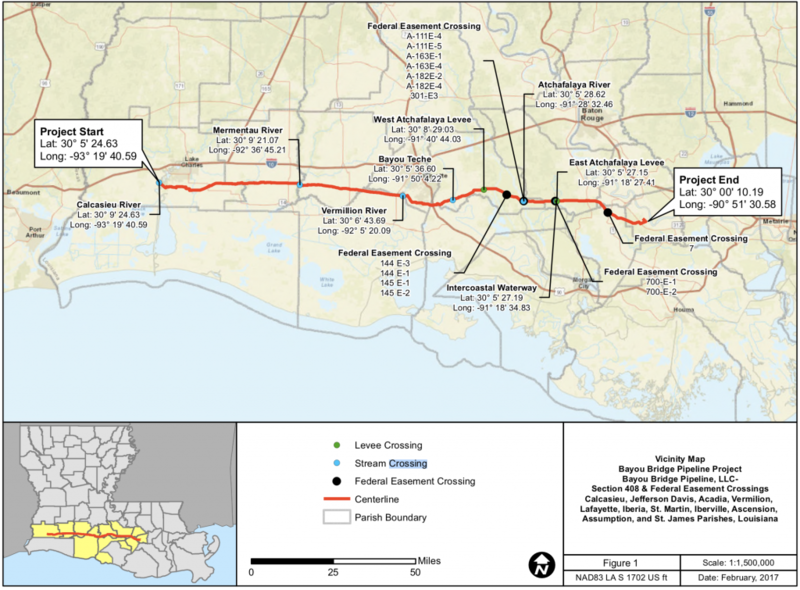 The above map, taken from a declaration submitted to a federal appeals court, shows the pipeline’s route through the Atchafalaya Basin as well as the areas of the Basin, shaded orange, where Condition M applies. The provision is only relevant to two narrow strips of land at the two levees that form the Basin’s eastern and western boundaries. In this third and final map, the orange triangle represents the eastern levee identified by the previous two maps, while the blue circles indicate the locations the coalition claims the Condition M violations occurred. 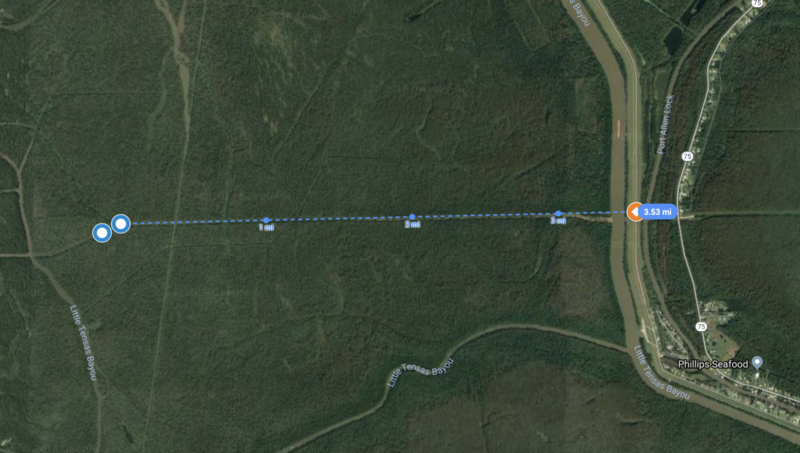 As previously mentioned, these two locations are more than 3.5 miles away from the nearest Section 408 permit area at the Basin’s eastern levee, making it geographically impossible for a Condition M violation to have taken place.